If you've been reading my blog the last few months, you'll have noticed that I've had a slight obsession with banana bread. Even though I made up a pretty good recipe about a year ago, I needed to create a good alternative for my 21-day vegan challenge. Because without banana bread, life's just not as good. I knew that vegan banana bread is really delicious (proof here and here), so I had full confidence that I wouldn't be let down. 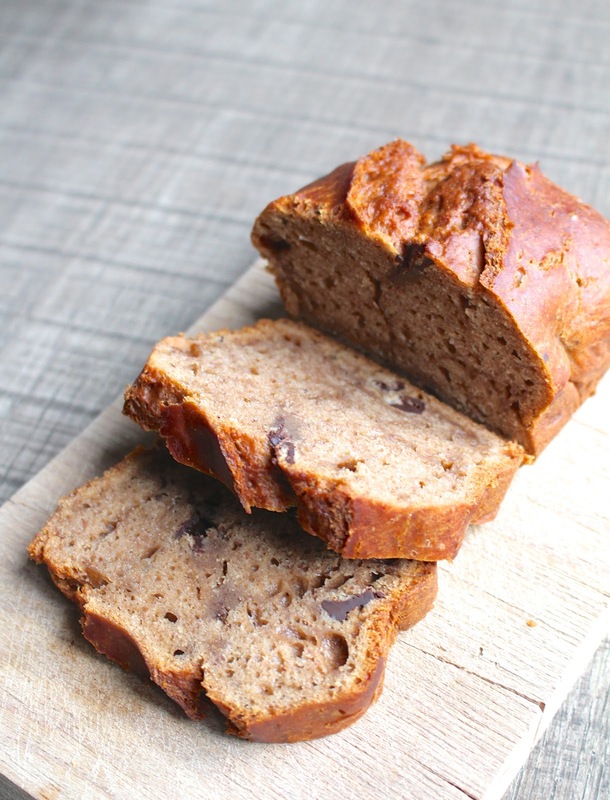 And let me tell you, it's even easier to make than non-vegan banana bread - only 6 ingredients! Preheat the oven to 200 degrees Celsius. Take your blender and blend the bananas, sugar and oil together until it's smooth. Then add the flour, baking powder and cinnamon. Stir/mix well until it's a smooth batter. Add in any extras you might fancy; I added some dark 85% Lindt chocolate (it was gooood). Pour the batter into a loaf-sized baking tin and pop it in the oven for about 30-40 minutes. After 30 minutes, check with a knife if the middle has been cooked. If it comes out clean, the banana bread is ready. Let it cool for 15 min. It tastes best when it's still a bit warm, otherwise you can also cut some slices and toast them. Enjoy like that or with some almond butter on top, my favourite combination! As you can see this banana bread has the perfect light cake-texture. You can hardly believe that this is vegan, it's almost too good to be true. I think I'll be whipping up many of these babies. Let me know if you try this recipe and tag me on Instagram !